Posted by Dave Emory ⋅ August 30, 2015Post a comment Email This Post Print This Post Tweet This! Beyond Obama’s rhetorical embrace, our “allies” in Ukraine, said to “share our values” are engaging in profound Holocaust revisionism without so much as a peep from our State Department or any other significant Western nation. Once again we set forth political developments in Ukraine against the scenario presented in Serpent’s Walk. In that Nazi tract, the SS go underground in the aftermath of World War II, build up their economic muscle, buy into the opinion-forming media, infiltrate the American military, and–following a series of terrorist incidents in the U.S. which cause the declaration of martial law–take over the United States. Central to this takeover is the use of the Nazi-controlled opinion-forming media to fundamentally revise history in a pro-Hitler fashion. Just such a revision is underway in Ukraine. The program details the continuity between the OUN/B World War II collaborator government allied with Nazi Germany, the Yuschenko government brought to power by the so-called “Orange Revolution,” and the Poroshenko government that developed from the Maidan coup. With the World War II history of Ukraine being fundamentally re-written by the Orwellian “Institute for National Memory” and institutionalized by a new law that criminalizes criticism of the OUN/B or its military arm the UPA, the political narrative of the Third Reich is becoming the prevailing political theme in the West. Headed up by an OUN/B operative named Volodomyr Viatrovych, the Institute for National Memory drew heavily on the privately-funded Center for the Study of the Liberation Movement. Financed largely by the Ukrainian diaspora, the center has as its explicit purpose the rehabilitation of the OUN/B. In addition to the fundamental perversion of Ukraine’s World War II history, the Orwellian process at work in Ukraine is revising the history of some of Stephan Bandera’s predecessors and ideological mentors. The program concludes with discussion of the apparent cover-up by U.S. and other Western governments of the shoot-down of MH-17. Review of the evolution of the OUN/B milieu from World War II, through the Reagan administration and the Yushcenko and Poroshenko regimes. The role of the Ukrainian diaspora in the historical development of the OUN/B forces now holding sway in Ukraine. Review of Poroshenko’s resuscitation of the old Yuschenko team, including Roman Svarych, Jaroslav Stetsko’s personal secretary. Review of Yuschenko and Poroshenko’s honoring of the OUN/B executioners at the site of the Babi Yar massacre. Review of the Yuschenko’s links to the MAUP university milieu, the anti-Semitic private educational institute that employs David Duke as a faculty member. Viatrovych’s appointment to head The Institute of National Memory under Yuschenko and his re-appointment to the same position under Poroshenko. The gravitas of David Duke in the political milieu embraced by Yuschenko and Poroshenko. 1. A recent law passed in Ukraine makes it illegal to criticize the Third Reich allies OUN/B and its military wing the UPA. That law is following up on the creation of the Institute for National Memory, headed by an OUN/B agent named Volodomyr Viatrovych. The history of World War II continues to be fundamentally perverted in Ukraine, with much of Western journalism and academia following suit. In the story below, note the continuity between the Yuschenko and Poroshenko regimes, including the selection of Viatrovych to head The Institute of National Memory. Note the role in Viatrovych’s efforts played by the Ukrainian diaspora. “How Ukraine’s New Mem­ory Com­mis­sar Is Con­trol­ling the Nation’s Past” by Jared McBride; The Nation; 8/13/2015. Volodymyr Via­tro­vych was the dri­ving force behind new laws that restrict free speech and reg­u­late how his­tory is writ­ten. Since the Maidan upris­ing and the sub­se­quent attacks on Ukraine’s sov­er­eignty and ter­ri­tory by Rus­sia and Russian-backed rebels, there has been intense debate on how to inter­pret not only Ukraine’s dra­matic present, but also its com­plex and dif­fi­cult past. Against the back­ground of mil­i­tary and diplo­matic strug­gles, the rep­re­sen­ta­tion of Ukraine’s his­tory is also embat­tled, espe­cially the period of World War II. Russ­ian elites have labeled any­thing and every­thing they do not like about past and present Ukraine as “fas­cist.” Partly this is a reflex due to the mem­ory of right-wing Ukrain­ian nation­al­ism dur­ing the first half of the twen­ti­eth cen­tury; partly this is the result of a fail­ure to find any bet­ter way to express anger at Ukraine’s turn to the West. There has been no short­age of West­ern com­men­ta­tors attack­ing this crude propaganda. How­ever, among rep­re­sen­ta­tives of Kiev’s new post-revolutionary elites, unbi­ased engage­ment with Ukraine’s past has also been a chal­lenge. But while the West is pil­lo­ry­ing Russ­ian dis­tor­tions, it is much less at ease crit­i­ciz­ing Ukrain­ian ones: Few West­ern observers feel sym­pa­thy for Putin’s involve­ment in Ukraine (I myself have none). There are many, how­ever, who seem to wel­come any his­tor­i­cal nar­ra­tive ruf­fling Russia’s feath­ers or appear­ing “pro-Ukrainian” or “national” (in real­ity, quite often nation­al­ist), as the nation is fac­ing out­side aggres­sion and domes­tic cri­sis. Yet this form of “sup­port” is a disservice—to Ukraine and also to the West’s pub­lic and decision-makers. It is alarm­ing that some West­ern jour­nal­ists, schol­ars, and policy-makers are embrac­ing a nation­al­ist ver­sion of Ukrain­ian his­tory that res­onates only with part of Ukrain­ian soci­ety and not at all with seri­ous aca­d­e­mic dis­course in Europe and North America. Front and cen­ter in the efforts to pro­duce a nation­al­ist ver­sion of Ukrain­ian his­tory is the for­mer direc­tor of the country’s secret-police archives (SBU) and new (sic) direc­tor of the Insti­tute of National Mem­ory (or UINP) under the cur­rent gov­ern­ment of Pres­i­dent Petro Poroshenko: Volodymyr Via­tro­vych. Via­tro­vych (born 1977), from the west­ern Ukrain­ian city of Lviv, first stepped onto the national scene when he was put in charge of the archive sec­tion of the newly cre­ated Insti­tute of National Mem­ory in 2008 and then head of the SBU archives later that year. In these influ­en­tial posi­tions, he helped in the effort to “exon­er­ate” a key World War II Ukrain­ian nation­al­ist leader of any com­plic­ity in the Holo­caust; pre­sented the nation­al­ist Ukrain­ian Insur­gent Army as a demo­c­ra­tic orga­ni­za­tion open to Jew­ish mem­bers; and focused heav­ily on Ukrain­ian vic­tim­iza­tion dur­ing the famine of the 1930s (while, inter­est­ingly, also blam­ing Jews as per­pe­tra­tors). Via­tro­vych has made a name for him­self as a polit­i­cal activist by instru­men­tal­iz­ing his schol­arly cre­den­tials. Both before and after his secret-service archive tenure, he was the head of the Cen­ter for the Study of the Lib­er­a­tion Move­ment (or Tsentr Doslidzhen’ Vyzvol’noho Rukhu, TsDVR) in Lviv. The research cen­ter is funded by pri­vate money from Ukrain­ian groups abroad that have helped shape its research agenda. The unam­bigu­ous goal of the cen­ter is to paint the Ukrain­ian nation­al­ists, in par­tic­u­lar the OUN and UPA (two of the most impor­tant Ukrain­ian nation­al­ist orga­ni­za­tions from the inter­war and World War II period), as “lib­er­a­tors” from Soviet, Pol­ish, and Ger­man oppres­sion. Rad­i­cal right-wing Ukrain­ian nation­al­ists are depicted as noth­ing but tragic free­dom fight­ers, occa­sion­ally forced to don Nazi uni­forms to strug­gle for inde­pen­dence, lib­erty, and West­ern val­ues. This is the party line at the cen­ter, one largely shaped by Viatrovych. Viatrovych’s own “schol­arly” out­put echoes the goals of his cen­ter.In a num­ber of pub­li­ca­tions he has cov­ered a laun­dry list of flash­points in 20th-century Ukrain­ian his­tory, from the vicious anti-Jewish pogroms of World War I through Ukrainian-Polish vio­lence dur­ing and after World War II.What uni­fies his approach is a relent­less drive to excul­pate Ukraini­ans of any wrong­do­ing, no mat­ter the facts. For exam­ple, con­cern­ing Ukrain­ian nation­al­ist involve­ment in the Holo­caust, in Viatrovych’s world, col­lab­o­ra­tion never hap­pened or was coerced and, at any rate, can’t be blamed on nation­al­ism; all evi­dence to the con­trary is blithely assigned to Soviet lies. On the nation­al­ist eth­nic cleans­ing of Poles in 1943–44, Via­tro­vych lets us know that that was a sort of tragic but sym­met­ri­cal war­fare. And as we all know, war is cruel and bad things hap­pen. When con­fronted with the fact that the head of UPA, Roman Shukhevych, served the Nazis until 1943 as com­man­der of a mobile police bat­tal­ion that mur­dered thou­sands of civil­ians in Belarus, Via­tro­vych responded: “Is it pos­si­ble to con­sider Poles or Belaru­sians a peace­ful pop­u­la­tion, if, dur­ing the day, they work as ordi­nary vil­lagers, only to arm them­selves in the evening and attack the vil­lage?” In other words, civil­ians are fair tar­gets, espe­cially for “heroes” of Ukraine in the ser­vice of Nazis. In the aca­d­e­mic world, such tac­tics have their lim­its. But when con­fronted with solid archival evi­dence con­trary to his sto­ries, such as orders from OUN-UPA lead­er­ship to cleanse the Pol­ish pop­u­la­tion of Vol­hy­nia, Via­tro­vych sim­ply claims that doc­u­ments are Soviet forg­eries or that schol­ars chal­leng­ing him are serv­ing sin­is­ter pro­pa­ganda pur­poses. Selec­tiv­ity rules: If there is no smoking-gun doc­u­ment for nation­al­ist crimes, it’s excul­pa­tory; when there is no smoking-gun doc­u­ment for pre­med­i­tated Soviet geno­cide against Ukraini­ans, it’s a result of KGB cun­ning. Via­tro­vych deals with video tes­ti­mo­nial archives and the inte­gra­tion of wit­ness tes­ti­mony into his­tory with bravado, sim­ply ignor­ing them (and espe­cially Jew­ish voices) alto­gether when he dis­likes what they have to tell us. This abysmal eth­i­cal and method­olog­i­cal approach has been chal­lenged by schol­ars from Poland, Scan­di­navia, Ger­many, Canada, and the United States, in addi­tion to a few brave Ukrain­ian ones. These schol­ars have writ­ten exco­ri­at­ing reviews of his works. Unlike his writ­ings, these reviews were pub­lished in peer-reviewed journals. There are no career reper­cus­sions for poor schol­ar­ship when you are a polit­i­cal activist. Thanks to his cre­den­tials as “for­mer SBU archive direc­tor,” direc­tor of a promi­nent “research” insti­tute, and a brief stint as a research fel­low at the Har­vard Ukrain­ian Research Insti­tute (HURI), which show up in every bio-blurb pos­si­ble, Via­tro­vych is cited fre­quently in the Ukrain­ian media. Iron­i­cally, as he has gained more neg­a­tive atten­tion from schol­ars, he has tra­versed a dif­fer­ent arc in Ukraine—increasingly trusted as a voice of wis­dom, a young, fresh force promis­ing to defend and pro­mote Ukraine’s his­tory, here under­stood as the glo­ri­ous record of Ukrain­ian nation­al­ism. It was no sur­prise when in late 2014 Pres­i­dent Poroshenko chose him as head of the Ukrain­ian Insti­tute of National Mem­ory, a gov­ern­ment body orig­i­nally cre­ated by then Pres­i­dent Yushchenko to sup­port research and forge a national mem­ory policy. Via­tro­vych wasted lit­tle time after this appoint­ment. He became the dri­ving force behind the so-called de-communization laws that were put on the books this spring. In real­ity, these laws reg­u­late how his­tory should be writ­ten and place restric­tions on free speech, and thus are deeply at odds with Kiev’s claims to West­ern val­ues. Law No. 2538–1, “On the legal sta­tus and hon­or­ing of fight­ers for Ukraine’s inde­pen­dence in the 20th cen­tury,” states that “the pub­lic denial of…the just cause of the fight­ers for Ukrain­ian inde­pen­dence in the 20th cen­tury insults the dig­nity of the Ukrain­ian peo­ple and is ille­gal.” The fight­ers for Ukrain­ian inde­pen­dence explic­itly include the World War II nation­al­ists of the OUN and UPA.In essence, this law makes it at least very risky to crit­i­cize them or point out the crimes in which they par­tic­i­pated. As with sim­i­lar Putin­ist leg­is­la­tion in Russia—namely Arti­cle 354.1, which crim­i­nal­izes any devi­a­tions from the Kremlin’s ver­sion of World War II and was passed by the Russ­ian Duma in 2014—the very vague­ness of phras­ing is a handy weapon of poten­tial repres­sion: it is a dis­turb­ing mys­tery how the state or other accusers are going to deter­mine who insulted the dig­nity of vio­lent eth­nic cleansers and happy author­i­tar­i­ans or how the courts are going to pros­e­cute those guilty of such thought crimes. Law No. 2540, “On access to the archives of repres­sive orga­ni­za­tions of the com­mu­nist total­i­tar­ian regime from 1917–1991,” puts all secret-police archives under the con­trol of the National Mem­ory Insti­tute in Kiev, headed by Viatrovych. These new laws have been crit­i­cized in a num­ber of jour­nals and mag­a­zines. Why they are deeply flawed should be obvi­ous to any­body com­mit­ted to even ele­men­tary prin­ci­ples of free speech and democ­racy. The reac­tion to the laws was pre­dictable: first, there was a response from the West­ern aca­d­e­mic com­mu­nity. Sev­enty lead­ing schol­ars, includ­ing some from East­ern Europe, signed an open let­ter protest­ing the laws. Other orga­ni­za­tions, such as the Orga­ni­za­tion for Secu­rity and Coop­er­a­tion in Europe, the Kharkiv Human Rights Pro­tec­tion Group, and the United States Holo­caust Memo­r­ial Museum warned of their dan­gers. For­eign media out­lets also took notice. Yet, despite the out­cry, except for a few arti­cles by West­ern schol­ars, there has been lit­tle dis­cus­sion of Viatrovych’s per­sonal role in mak­ing the laws or the larger back­drop of aggres­sive his­tory pol­i­tics, going back to 2005. A few of the most promi­nent Ukrain­ian intel­lec­tu­als pro­vided com­men­tary that half-heartedly con­demned a crack­down on free speech, but they focused on ques­tion­ing the atti­tude of West­ern schol­ars protest­ing against the laws. Other Ukrain­ian com­men­ta­tors have pro­vided rather muted crit­i­cism of the laws, less because of the politi­ciza­tion of his­tory and more due to issues of finan­cial and pri­vacy con­cerns. Only a few Ukrain­ian com­men­ta­tors did con­demn the laws on prin­ci­pled grounds related to aca­d­e­mic free­dom and his­tor­i­cal revisionism. Sadly, the Ukrainian-diaspora schol­arly com­mu­nity in North Amer­ica has often sup­ported these restric­tive laws. Regard­ing Via­tro­vych, they see no prob­lem with hav­ing a par­ti­san polit­i­cal activist in charge of the country’s secret-police archives; rather the for­eign schol­ars and their “insen­si­tive research” agen­das that dis­cuss the dark spots of Ukraine’s his­tory are the real prob­lem for Ukraine. In a recent round­table inter­view with two well-known schol­ars and one mem­ber of the Ukrainian-American com­mu­nity, West­ern schol­ars were described as “neo-Soviet” and their response as “quasi-hysterical.” In a mis­placed “post-colonial” twist, the “pro­pri­ety or author­ity of for­eign­ers to instruct Ukraine’s elected rep­re­sen­ta­tives as to whom they wish to acknowl­edge or memo­ri­al­ize and why” was ques­tioned. The laws were praised as the answer to out­side tam­per­ing in Ukraine’s his­tory. On the issue of free speech, there was hedg­ing. In an Orwellian key, Alexan­der Motyl, a polit­i­cal sci­en­tist at Rut­gers University-Newark, went as far as to com­pare Ukraine’s his­tory reg­u­la­tion laws to civil rights laws, women’s rights, and laws pro­tect­ing the gay com­mu­nity in the United States. This is not the first time Motyl’s analo­gies to US his­tory have caused shock in var­i­ous schol­arly communities. There has been lit­tle con­tro­versy in the West about putting Ukraine’s secret-police archives in Viatrovych’s hands: the responses from Ukrain­ian intel­li­gentsia have ranged from joy to muted con­cerns about pri­vacy issues. Motyl excit­edly called the archives law a “coup for free­dom and justice”—unsurprisingly, given that he is per­haps the only scholar to have praised Viatrovych’s recent book. Out­side of per­cep­tive pieces in Ukrain­ian by Vasyl Rasevych, a his­to­rian and writer, and Stanislav Ser­hi­ienko, an activist and writer, about the dan­gers of archive tam­per­ing, few com­menters, includ­ing those in the West, seem to worry about the poten­tial manip­u­la­tion of the archives. The dialec­tics of national lib­er­al­ism aside, Motyl’s term “coup” is an appo­site Freudian slip. We might ask our­selves why a nation’s most polit­i­cally sen­si­tive doc­u­ment col­lec­tion should be entrusted with a polit­i­cal activist inter­ested in one and only one ver­sion of the past, rather than putting them under the aus­pices of the cen­tral state archive admin­is­tra­tion. A while ago, when a Com­mu­nist was direc­tor of Ukraine’s archival admin­is­tra­tion, West­ern observers were wor­ried. The fail­ure to worry when a nation­al­ist defend­ing the record of right-wing author­i­tar­i­ans takes over the national mem­ory project and the secret-police files is disturbing. If the response from the diaspora-oriented schol­arly com­mu­nity to the laws and Viatrovych’s appoint­ment has been scan­dalous, the naïveté with which some West­ern observers have embraced the nation­al­ist nar­ra­tive is even more trou­bling. Fol­low­ing the Maidan rev­o­lu­tion, Via­tro­vych is now cited as a voice of knowl­edge in the Ukrain­ian and West­ern media. The Chris­t­ian Sci­ence Mon­i­tor has quoted him in an arti­cle about Ukraine’s past, where he explained that to dis­pel “myths” Ukraine should “cre­ate an open, national dia­logue.” With no acknowl­edg­ment (or, prob­a­bly, knowl­edge) of Viatrovych’s back­ground as a myth-maker-in-chief him­self, the arti­cle uncrit­i­cally presents him as a voice for the future. Even more egre­gious was the arti­cle “Is There a Future for Ukraine?” by Peter Pomer­ant­sev, a jour­nal­ist and pro­ducer who writes fre­quently on Rus­sia, which appeared in The Atlantic in July 2014. Pomer­ant­sev inter­viewed and pro­filed Via­tro­vych as a car­rier of hope for Ukraine’s future. Pomer­ant­sev has man­aged to rec­og­nize in Via­tro­vych “a lib­eral nation­al­ist,” work­ing to “cre­ate a Ukrain­ian identity”—strange praise for a man claim­ing to be a scholar, a pro­fes­sion usu­ally engaged in open-ended inquiry, not iden­tity build­ing. Pomer­ant­sev tells his read­ers that Via­tro­vych is “best known for his work on refor­mat­ting Ukraine’s rela­tion­ship to the Sec­ond World War,” which is both an under­state­ment and a hor­ri­bly reveal­ing choice of terms. In his mostly uncrit­i­cal por­trayal, he writes that Via­tro­vych “believes he can help bridge these divi­sions [in Ukrain­ian soci­ety] and cre­ate a story that is at once nation­al­ist and inte­gra­tionist.” When asked about a pos­i­tive uni­fy­ing mes­sage, Via­tro­vych matter-of-factly tells him that Rus­sians want “tyranny” and Ukraini­ans want “free­dom.” Pomer­ant­sev swal­lows this big­oted state­ment of frank stereo­type about large pop­u­la­tions with no response, since com­pared to the overtly racist Ukrain­ian nation­al­ist he inter­viewed in the first part of the same arti­cle, Via­tro­vych comes across as less bru­tal. But per­haps also because “we” in the West now con­sider it good form to cut a Ukrain­ian nation­al­ist more slack than a Russian. . . .
2. In FTR #781, we noted that Viktor Yuschenko–married to top OUN/B official and Reagan Deputy Director of Presidential Liaison Ykaterina Chumachenko–institutionalized the Bandera political cadre, rewriting Ukrainian World War II history and paving the way for the rise of Swoboda and Pravy Sektor. Note, again, that Viatrovych was appointed to head the Institute of National memory by Yuschenko and re-appointed to the same position by Poroshenko. We review the fact that the “new” Ukrainian President Petro Poroshenko has reconstituted the old Yuschenko team, including American-born Roman Zvarych (“Svarych”), Yuschenko’s Minister of Justice and the personal secretary to OUN/B leader Yaroslav Stetsko in the early 1980’s. Stetsko was the World War II head of the Ukrainian Nazi satellite state and headed the Anti-Bolshevik Bloc of Nations and its primary element, the OUN/B. Stetsko was an adherent to Nazi ethnic cleansing doctrine, practicing it vigorously against ethnic Poles, ethnic Russians and Jews during the Second World War. “Ukraine’s New President Poroshenko Leads Old Team”; Deutsche Welle; 6/7/2014. . . . . But a close look at his team quickly shows that Poroshenko has surrounded himself with officials from the Yushchenko era. For example, Poroshenko’s election campaign was planned by Ihor Hryniv. The 53-year-old member of parliament and former director of the Kyiv Institute for Strategic Studies was once Yushchenko’s adviser. He later represented his party “Nasha Ukraina” (Our Ukraine) in parliament. Elsewhere in the country the picture is the same. Viktor Baloha, for example, was the head of Yushchenko’s secretariat during his presidency. He headed Poroshenko’s election campaign in the western Ukrainian province of Transcarpathia. . . .
3. Fleshing out discussion of the development of Viatrovych and the Institute of National Memory, we review how Viktor Yuschenko set the stage for what the Poroshenko government is doing. Note that Yuschenko’s wife was a key UCCA operative Ykaterina Chumachenko/Yuschenko, who had been Ronald Reagan’s Deputy Director of Public Liaison. Yuschenko’s minister of justice (the equivalent of the U.S. Attorney General) was Roman Svarych, Jaroslav Stetsko’s personal secretary in the early 1980’s. “The Return of the Ukrainian Far Right: The Case of VO Svoboda,” by Per Anders Rudling; Analyzing Fascist Discourse: European Fascism in Talk and Text edited by Ruth Wodak and John E. Richardson; Routledge [London and New York] 2013; pp. 228-255, more. Note that this book is in Google Books.
. . . . . Swept to power by the Orange Revolution, the third president of Ukraine,Viktor Yushchenko (2005–2010), put in substantial efforts into the production of historical myths. He tasked a set of nationalistically minded historians to produce and disseminate an edifying national history as well as a new set of national heroes. . . . .
. . . . . The OUN wings disagreed on strategy and ideology but shared a commitment to the manufacture of a historical past based on victimization and heroism. The émigrés developed an entire literature that denied the OUN’s fascism, its collaboration with Nazi Germany, and its participation in atrocities, instead presenting the organization as composed of democrats and pluralists who had rescued Jews during the Holocaust. The diaspora narrative was contradictory, combining celebrations of the supposedly anti-Nazi resistance struggle of the OUN-UPA with celebrations of the Waffen SS Galizien, a Ukrainian collaborationist formation established by Heinrich Himmler in 1943 (Rudling, 2011a, 2011c, 2012a). Thus, Ukrainian Waffen SS veterans could celebrate the UPA as “anti-Nazi resistance ﬁghters” while belonging to the same war veterans’ organizations (Bairak, 1978). Unlike their counterparts in some other post-Soviet states, Ukrainian “nationalizing” historians did not have to invent new nationalist myths but re-imported a narrative developed by the émigrés (Dietsch, 2006: 111–146; Rudling, 2011a: 751–753). . . . .
As president, Yushchenko initiated substantial government propaganda initiatives. In July 2005, he established an Institute of National Memory, assigned the archives of the former KGB (now the SBU, Sluzhba Bezpeki Ukrainy, the Ukrainian Security Service) formal propagandistic duties and supported the creation of a “Museum of Soviet Occupation” in Kyiv (Jilge, 2008: 174). Yushchenko appointed the young activist Volodymyr V’’iatrovych (b. 1977) director of the SBU archives. V’’iatrovych combined his position as government-appointed memory manager with ultra-nationalist activism; he was simultaneously director of an OUN(b) front organization, the Center for the Study for the Liberation Movement. State institutions disseminated a sanitized, edifyingly patriotic version of the history of the “Ukrainian national liberation movement,” the leaders of which were presented in iconographic form as heroic and saintly ﬁgures, martyrs of the nation (Rasevych, 2010; Rudling, 2011c: 26–33, 2012b). Yushchenko’s mythmaking had two central components. The ﬁrst was the presentation of the 1932–1933 famine as “the genocide of the Ukrainian nation,” a deliberate attempt to exterminate the Ukrainians which, his myth-makers claimed, resulted in the death of 10 million people in the republic. The other component was a heroic cult of the OUN(b), the UPA and their leaders. The “memory managers” juxtaposed the genocidal Soviet rule with the self-sacriﬁcial heroism of the OUN-UPA, producing a teleological narrative of suffering (the famine) and resistance (the OUN-UPA) leading to redemption (independence, 1991). Curiously, Yushchenko’s legitimizing historians presented their instrumentalized use of history as “truth,” which they juxtaposed to “Soviet myths.” Wilfried Jilge, a historian at the University of Leipzig, writes that “[i]t takes place by means of discourse, rituals, and symbols and uses the past to provide legitimization and to mobilize the population for political purposes.
. . . A reconstructed historical memory is created as ‘true memory’ and then contrasted with ‘false Soviet history’ ”(Jilge, 2007:104–105). Thus, Valentyn Nalyvaichenko, SBU director under Yushchenko, described the task of his agency as being to disseminate “the historical truth of the past of the Ukrainian people,” to “liberate Ukrainian history from lies and falsiﬁcations and to work with truthful documents only” (Jilge, 2008:179). Ignoring the OUN’s antisemitism, denying its participation in anti- Jewish violence, and overlooking its fascist ideology, Nalyvaichenko and his agency presented the OUN as democrats, pluralists, even righteous rescuers of Jews during the Holocaust. The hegemonic nationalist narrative is reflected also in academia, where the line between “legitimate” scholarship and ultra-nationalist propaganda often is blurred. Mainstream bookstores often carry Holocaust denial and antisemitic literature, some of which ﬁnds its way into the academic mainstream (Rudling, 2006). So too, for instance, can academic works on World War II by reputable historians integrate the works of Holocaust deniers and cite the former KKK Grand Wizard David Duke as a “expert” on the “Jewish Question.” . . . .
. . . . The culmination of Yushchenko’s Geschichtspolitik was his designation, a few days before leaving ofﬁce, of Bandera as a hero of Ukraine. Again, there was little protest from intellectuals who identify themselves as liberals. . . . .
. . . . On June 30, 2011, the 70th anniversary of the German invasion and Stetsko’s “renewal of Ukrainian statehood” was re-enacted in Lviv as a popular festival, where parents with small children waved ﬂags to re-enactors in SS uniforms. . . .
. . . . . Ironically, the presentation of the OUN as resistance fighters against Nazi Germany coexists with an elaborate cult of the Waffen SS Galizien (Rudling, 2012a). Lviv streets have been renamed after Nazi collaborators like Roman Shukhevych and Volodymyr Kubijovyc. In the Lviv city hall, Svoboda is currently working to have the Lviv airport renamed after Bandera. Svoboda deputy Iuryi Mykahl’chyshyn stated, “We should have the airport named after Stepan Bandera. I don’t want to point any fingers. . . . But we will have a Bandera airport, a Bandera stadium, and the entire city will be carrying Bandera’s name, because he is its most living symbol”(“U L’vovi budut’ stadion,” 2012). In the fall of 2011, Svoboda deputies in a municipality in the Lviv district renamed a street from the Soviet-era name Peace Street (Vulytsia Myru ) to instead carry the name of the Nachtigall Battalion, a Ukrainian nationalist formation involved in the mass murder of Jews in 1941, arguing that “ ‘Peace’ is a holdover from Soviet stereotypes”(“Vulytsiu myru,” 2011). . . .
. . . . Svoboda’s claims to the OUN legacy are based upon ideological continuity, as well as organization and political culture (Shekhovtsov, 2011b:13–14). Presenting Svoboda as the successor of Dontsov and the OUN, Tiahnybok regards Svoboda as “an Order-party which constitutes the true elite of the nation” (Tiahnybok, 2011). Like those of many other far-right movements, Svoboda’s ofﬁcial policy documents are relatively cautious and differ from its daily activities and internal jargon, which are much more radical and racist (Olszan´ski, 2011). Svoboda subscribes to the OUN tradition of national segregation and demands the re-introduction of the Soviet “nationality” category into Ukrainian passports. “We are not America, a mishmash of all sorts of people,” the Svoboda website states. “The Ukrainian needs to stay Ukrainian, the Pole—Polish, the Gagauz—Gagauz, the Uzbek—Uzbek” (“Hrafa ‘natsional’nost’v pasporti,” 2005). 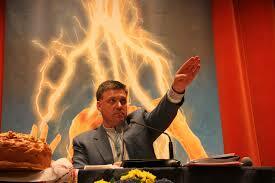 Svoboda’s ultra-nationalism is supplemented with more traditional “white racism” (Shekhovtsov, 2011b: 15). . . . .
. . . . Conspiracy theory is integral to Svoboda Weltanschauung, particularly conspiracies with anti-Semitic undertones. In August 2011, in an apparent attempt to distance themselves from the Norwegian terrorist Anders Behring Breivik, Svoboda claimed that he was a Jewish Mason (Redkolehiia chaso-pysu “Svoboda,” 2011). In September 2011, Svoboda activists mobilized from several parts of Ukraine to organize rallies against Hasidic pilgrims to Uman. Following violent clashes, the police detained more than 50 Svoboda activists, armed with gas canisters, smoke bombs and catapults. The Cherkasy branch of Svoboda criticized the police for their alleged failure “to stop and avert aggression by Hasidic Jews to Ukrainians” (“Uman: Righ-twing activists detained,” 2011).Svoboda’s anti-Russian and anti-Jewish rhetoric is accompanied by an anti-Polish message. Svoboda maintains that Poland has played a negative historical role in Ukrainian lands. The party demands an ofﬁcial apology from Poland for ﬁve hundred years of Polonization, from the 15th to the 20th centuries, and indemnities for “the Polish terror and occupation of Ukrainian lands in the 20th century” (“Zaiava VO ‘Svoboda’ shchodoproiaviv ukrainofobii,” 2010). Focusing on divisive and sensitive issues, Svoboda provocatively denies any involvement of the Waffen SS Galizien in atrocities against the Polish minority in Galicia. For instance, on the site of Huta Pieniacka, Svoboda has placed a huge billboard denying the conclusion of both Polish and Ukrainian historical commissions that the fourth police regiment, which was later adjoined to the Waffen SS Galizien, burnt this Polish village and slaughtered most of its residents on February 28, 1944. . . .
. . . . Svoboda is a member of the so-called Alliance of European National Movements, a network which includes theBritish National Party, Nationaldemokraterna of Sweden, the Front National in France, Fiamma Tricolore in Italy, the Belgian National Front, and the Hungarian Jobbik (Umland, 2011). This seemingly unlikely cooperation is partly facilitated by a joint fascination with ethnic purity, inspired by Alain de Benoit, the ideologue of the French Nouvelle Droit. De Benoit fears the disappearance of pluralism and the reduction of all cultures into a world civilization and argues that each ethnos should be allowed to develop independently on its given territory, without the admixture of other cultures. Nationaldemokraterna, their Swedish sister party, advocates a form of ethnic segregation, which they refer to as “ethnopluralism” (Dahl, 1999: 68, 136). Tiahnybok’s heroization of the Waffen SS Galizien and other Nazi collaborators is accompanied by ideological claims that the OUN-UPA conducted an anti-Nazi resistance struggle against Hitler. While hardly a typical man of the belles-lettres , Mykhal’chyshyn, is actually a student of fascism. . . . His interest is not exclusively academic; under the pseudonym Nachtigall 88, Mykhal’chyshyn promotes fascist ideology with the purpose of promoting a fascist transformation of society in Web forums linked to Svoboda and “autonomous nationalists.” In 2005, he organized a political think tank, originally called “the Joseph Goebbels Political Research Center” but later re-named after the German conservative revolutionary Ernst Jünger. (Olszan´ski, 2011). Explicitly endorsing Hamas, Mykhal’chyshyn regards the Holocaust as “a bright episode in European civilization” which “strongly warms the hearts of the Palestinian population. . . . They hope it will be all repeated” (“Mikhal’chyshyn schitaet Kholokost,” 2011; “Ukrainskii natsist,” 2011). We recognize the heavy emphasis on heroes and heroism from the narrative of the émigré OUN and from Yushchenko’s legitimizing historians. The difference is that, unlike these two inﬂuences, Mykhal’chyshyn does not deny Bandera and Stets’ko’s fascism. On the contrary, their fascist ideology constitutes the basis for his admiration. . . .
. . . . While he is no longer a serious political player, Yushchenko left behind a legacy of myths which helped legitimized Svoboda’s ideology. Svoboda’s appropriation of many rituals in honour of “national heroes” from more moderate nationalists is but one expression of its increased political strength in post-Yushchenko Western Ukraine. . . .
. . . . On April 28, 2011, Svoboda celebrated the 68th anniversary of the establishment of the Waffen SS Galizien. Octogenarian Waffen SS veterans were treated as heroes in a mass rally, organized by Svoboda and the “autonomous nationalists.” Nearly 700 participants (the organizers claimed 2,000) marched down the streets of Lviv, from the massive socialist–realist style Bandera monument, to Prospekt Svobody, the main street, shouting slogans like “One race, one nation, one fatherland!,” . . . .
. . . . The procession was led by Mykhal’chyshyn . . . .
4. Part of the historical revisionism underway in Ukraine is the political rehabilitation of Symeon Petlyura, a blood-drenched pogromist and one of the early figures in the political movement that was to crystallize as the OUN/B. “Ukrainian Regime of Yuschenko Rehabilitates Symon Petlyura” by Felx Kreisel; mit.edu; 6/08/2006. Yushchenko’s government announced that during the eightieth anniversary year since his death the government will put a monument to Symon Petlyura, the Chief Ataman of the Ukrainian People’s Republic. During the week around this anniversary (Petlyura died in Paris on May 25th, 1926) there took place in Kiev a series of events to commemorate his life, in which the President of Ukraine, Yushchenko and members of his cabinet took part: a film was shown at the National Opera, an exhibit was displayed at the National Museum of Ukrainian History, a requiem service was staged at the St. Basil Cathedral, and so on. Symon Petlyura began his political activity in the ranks of the revolutionary socialist movement in the Ukrainian Social Democratic party. In order to combat Bolshevism, he threw over his democratic principles in favor of a personal dictatorship and colluded in a series of deals with enemies of his own people: with Germany, with Russian monarchists, with the Entente, with the reactionary Polish regime of Pilsudsky. In the West, Petlyura is best known for presiding over the bloody Jewish pogroms of 1919—1920. . . .
. . . . 80 years ago, on May 25, 1926, on a street in Paris a 40-year old Ukrainian Jew Shalom Schwartzbard approached a middle-aged person and asked in Ukrainian whether he was Mr. Petlyura. Upon receiving confirmation, Schwartzbard shot Petlyura point blanc a number of times, ecstatically shouting: “This is for the pogroms, this is for the murders, this is for your victims”, and killed the Chief Ataman of the Ukrainian national government during the years 1919-1920. Schwartzbard did not try to flee, and when a policeman ran over he surrendered his weapon to him, saying, “You can arrest me, I killed an executioner”. The death of Petlyura became an instant sensation on the front pages of Europe and America, but leading Soviet newspapers did not report any details of this assassination, and only gave brief inside page reports on the fact of Petlyura’s death. Public opinion was on the side of the Jewish avenger, Schwartzbard, whose personal story aroused sympathy and fellow feelings among both Jewish and non-Jewish masses. . . . .
5. Petro Poroshenko has also given momentum to the rehabilitation of Symon Petlyura, who helped craft the political template for contemporary Ukrainian ultra-nationalist politics. “Ukraine: Why Bandera Have the Largest Geo-Political Voice in EU” by George Eliason; OpEdNews.com; 8/1/2014. *”Bandera” here is used as a generic term for the followers of Stephan Bandera and their institutions–D.E. . . . . Simon Petliura was one of the original leaders of the Hapsburg countries to sign onto Prometheanism. But even as the recognized dictator of Ukraine he was forced to move the government into exile. The only acceptable form of government to a Ukrainian is the Galician (West Ukraine) model of extreme ultra-nationalism. Petliura is revered as a hero in Western Ukraine and a butcher everywhere else for his pogroms, torture, and murder. . . .
. . . . When Symon Petliura (president of the government in exile) was assassinated in 1926, Andrii Livytsky took over. In 1945 Livytsky reactivated the Government-in-exile of the Ukrainian National Republic and invited representatives of the new emigration to join it. In 1946 he instructed Isaak Mazepa to unite all political parties around the state center of the UNR, and that union eventually resulted in the organization of the Ukrainian National Council (1947). In 1945, at the founding of the United Nations, the Ukrainian Soviet Socialist Republic was given founding member status. Eventually through the work of the ABN, UNC, and many other Bandera (include all captive nation countries under ABN), the UNC stepped into this position unofficially. Eventually all factions of the Ukrainian Diaspora would coalesce around the UNC and the government in exile of Ukraine. By the 1980’s the Ukrainian National Republic government in exile became the only representation of a free Ukraine for Europe, the West, and its allies. . . .
. . . . That was what Maidan was about. When Poroshenko gave his inau­gural address he paid homage to this fact. He said that the wars of 1917–1920 had finally been won. This was acknowl­edged by his elec­tion. This new Ukraine was now under the laws and tra­di­tions of 1920’s Ukraine as demanded by Symeon Petliura. This was finally the Ukraine they had been wait­ing for. . . .
6. The Wikipedia entry on the Congress of Ukrainian Nationalists notes the Nazi-style anti-Semitism characterizing the Congress of Ukrainian Nationalists, but mistakenly relegates that to the past by noting their endorsement of Vladimir (“Ze’ev”) Jabotinsky. Jabotinsky was the leader of the Betar, an explicitly fascist element within the Zionist movement. The Congress of Ukrainian Nationalists was led and assembled by the above-mentioned Roman Svarych and Slava Statsko, Jaroslav Stetsko’s widow. “Congress of Ukrainian Nationalists”; Wikipedia.com. The Congress of Ukrainian Nationalists (Ukrainian: Конгрес українських націоналістів Konhres Ukrayinskykh Natsionalistiv) is a far-right political party in Ukraine. It was founded on October 18, 1992 and registered with the Ministry of Justice on January 26, 1993. The party leader from its formation and until her death in 2003 was Yaroslava Stetsko (people’s deputy of three VR conventions). The party was set up late 1992 by émigrés of OUN-B on the initiative of Slava Stetsko and Roman Zvarych. It was registered on 26 January 1993 by the Ukrainian Ministry of Justice and was the 11th political party in Ukraine that was officially registered. During the 1998 parliamentary election the party was part (together with Ukrainian Conservative Republican Party and Ukrainian Republican Party) of the Election Bloc “National Front” (Ukrainian: Виборчий блок партій «Національний фронт») which won 2,71% of the national votes and 6 (single-mandate constituency) seats. At the parliamentary elections on 30 March 2002, the party was part of the Viktor Yushchenko Bloc Our Ukraine. Former party leader Oleksiy Ivchenko was the head of Naftogas of Ukraine under the Yekhanurov Government. He was elected as the party leader on the seventh convention of the party on April 13, 2003. During the parliamentary elections on 26 March 2006, the party was part of the Our Ukraine alliance. Roman Zvarych was Minister of Justice in the First Tymoshenko Government and Second Tymoshenko Government and in the Alliance of National Unity. . . . . However, as of recently the official website the party appears to express support for Zionism and Israel (although not the Israeli government, for prosecuting Demjanjuk), and regards Ze’ev Jabotinsky as a hero . . . .
7.Vladimir Jabotinsky at one point attempted to form an alliance with Symon Petlyura, thereby providing the contemporary revisionists in Ukraine with a perfect propaganda vehicle with which to claim that Petlyura wasn’t anti-Semitic. “Jabotinsky’s Embarrassing Offer” by Shlomo Avineri; Haaretz; 7/19/2009. Last week, Haaretz reported that Kiev plans to name a major street after Symon Petliura, who headed the short-lived Ukrainian state that was founded after World War I. In Ukrainian eyes, Petliura is one of the founding fathers of Ukrainian nationalism, much like the leader of the 17th-century Cossack rebellion, Bohdan Khmelnytsky. In the Jewish narrative, Petliura is identified with pogroms in which tens of thousands of Jews were slaughtered. In 1926, Petliura was assassinated in Paris by Sholom Schwartzbard, who was seeking to avenge the murder of his family. Schwartzbard was acquitted in court and later passed away in South Africa. For years, he served as a symbol of Jewish pride among right-wing Zionists, and in 1967 his body was exhumed and transported to Israel for reburial in an official state ceremony initiated by Menachem Begin. Petliura’s name is barely known today in Israel, yet before the Nazis’ rise to power it represented murderous anti-Semitism. The pogroms in Ukraine were one of the factors that pushed Jews into the ranks of the Red Army, which waged war against Ukrainian nationalism. Ukrainian nationalists, on the other hand, viewed Schwartzbard’s act as part of a Jewish-Bolshevist conspiracy. What is less known is that after the fall of Petliura’s regime, none other than Ze’ev Jabotinsky signed an agreement with him in 1921. This is a complicated and embarrassing episode that sent huge shockwaves through the Zionist movement, of which Jabotinsky was then a leader. After independent Ukraine was defeated by the Red Army, Petliura found refuge in Poland, which had fought against Soviet Russia. He planned to return to Ukraine at the head of an army of exiled expatriates. Jabotinsky suggested that Petliura enlist units of Jewish soldiers. Clearly Jabotinsky’s rabid anti-Communism was one reason behind the proposal. Publicly, he rationalized the offer by claiming that the Jewish divisions in Petliura’s army would defend the Jewish population from possible pogroms. The suggestion allowed Petliura to claim that he was not anti-Semitic, and that the pogroms were simply “unfortunate” events that had occurred in the heat of battle. . . .
8a. We review an article noting that current Ukrainian president Poroshenko and former president Yuschenko visited the site of the Babi Yar massacre and placed wreaths honoring the OUN/B, whose ranks supplied the bulk of the executioners for the massacre. “Ukraine: World War II Fiasco Leads to Public Relations Disaster and Thorny Relations for Kiev and Foreign Diaspora” by Nicholas Kozloff; The World Post; 6/29/2015. For Kiev, winning the public relations war against Vladimir Putin would seem to be a no-brainer. For a year now, the Kremlin has conducted a thinly-disguised war of aggression in eastern Ukraine resulting in the deaths of thousands. Yet Kiev seems intent on squandering any international public support it might have had amidst a bizarre crackdown on free speech and censorship of controversial historical debates. Through its crackdown, Ukraine has actually played into Putin’s propaganda war and facilitated Russia’s PR efforts. One scholar, John Paul Himka, has concluded that the pogrom was mostly conducted by the OUN under German supervision. According to Himka, the OUN sought to demonstrate to the Nazis “that it shared their anti-Jewish perspectives and that it was worthy to be entrusted with the formation of a Ukrainian state.” . . . . the OUN fought the Soviets and strived for an independent Ukraine, many [of its] leaders were influenced and trained by Nazi Germany. Indeed, the OUN could be characterized as a far right terrorist group which hoped to consolidate an ethnically homogenous Ukraine and a totalitarian, one party state. “The truth is that the official policy of the OUN was openly anti-Semitic, including approval for Nazi-style Jewish extermination,” writes Eduard Dolinksy of the Ukrainian Jewish Committee. Dolinksy adds that it was only at the end of the war, when it became clear that Germany would be defeated, that the Ukrainian right changed its position. The OUN in fact played an important role in pogroms which spread across Western Ukraine in the summer of 1941, resulting in the deaths of tens of thousands of Jews. After the Nazis dissolved the militias, many members linked up with the Ukrainian police and helped carry out the Holocaust throughout Western Ukraine. Then, for good measure, the OUN assumed control over the Ukrainian Insurgent Army or UPA in 1943. . . . The Times of Israel notes “according to some historical accounts the group murdered thousands of Jews in the 1940s” [other historians, as well as supporters of the UPA, dispute this, claiming there were many Jews who themselves served in the ranks of the organization]. A recent article by Reuters claims the UPA shuttled victims into labor camps where they were subsequently executed. Furthermore, it is claimed the UPA was also guilty of conducting ethnic cleansing of Poles in 1943-44. The massacres in Eastern Galicia, which formed part of an overall UPA strategy aimed at creating a homogenous Ukrainian state, resulted in the deaths of 100,000 people. Amidst escalating war in the east, Ukraine desperately needs allies and popular foreign support. Given the desperate stakes, one would think that Kiev would come to terms with some of the unsavory aspects of its World War II past. Yet strangely, political elites are running hard in the opposite direction in an effort to coddle the extremist right. At issue is a highly controversial law recently signed by President Petro Poroshenko which honors the OUN and UPA. Under the new law, it would be a crime to question the likes of the UPA. Specifically, legislation stipulates that Ukrainians and even foreigners [including Americans?–D.E.] who “publicly insult” the memory of wartime partisans “will be held to account in accordance with Ukrainian law.” The bill does not specify the penalty for questioning Ukraine’s wartime past, nor does the state explain which body will enforce the legislation. On the other hand, it is possible that any private individual could bring a case to court. Though certainly distressing, Kiev’s approval of the retrograde law comes as little surprise. Former President Viktor Yushchenko, in fact, honored Ukrainian nationalists at a memorial in Babi Yar, where the most horrific massacre of Jews took place throughout the Holocaust. Not stopping there, Yushchenko then bestowed the highest government honor on none other than Stepan Bandera, a leader of the OUN. Perhaps, Yushchenko’s efforts helped to rehabilitate Bandera and others in the minds of many. As recently as 2013, radical nationalists were visibly active during Ukraine’s Maidan revolution. Indeed, rightists brandished a host of OUN and UPA flags on Maidan square while belting out partisan wartime songs [for a fuller discussion of such curious rightist symbolism, see my earlier article here]. If anything, the UPA’s popularity has soared ominously since the Maidan. Even more disturbingly, a number of OUN-UPA apologists currently hold important government positions in Kiev, and Poroshenko has done nothing to confront the radical right. In fact, the President has gone out of his way to follow in the footsteps of his reactionary predecessor Yushchenko by once again laying a wreath in honor of the OUN at Babi Yar. In addition, Poroshenko has labeled the UPA as “defenders of the fatherland” and established an official holiday in honor of the partisans. Perhaps, the new legislation could even harm Ukraine’s bid to join the European Union. Dolinsky writes “modern Ukrainians need to realize and comprehend this difficult and tragic history in order to become a truly European nation. Such laws as that recently signed by President Poroshenko can only harm the Ukrainian people.” For their part, some scholars have expressed grave dismay over developments in Kiev. Recently, a group of forty historians from western universities even signed an open letter of protest. While the recent World War II flak poses thorny questions for many in Ukraine proper, the imbroglio may prompt some soul searching within the wider foreign Diaspora, too. In the wider metropolitan New York area, the Ukrainian community numbers more than 100,000 people. In Manhattan’s East Village, sometimes known as “Little Ukraine,” locals expressed opposition to Russian influence while holding fundraisers in support of Maidan protest. Though the East Village has become gentrified in recent years, the neighborhood still sports landmarks such as the Association of Ukrainian-Americans; the Ukrainian National Home; the Veselka restaurant; a Ukrainian Church, and the local Ukrainian Museum. In the wake of Maidan protests in Kiev, Ukrainian-Americans took to the Brooklyn Bridge in support of demonstrations back home and even sang the national anthem on the subway. Indeed, EuroMaidan encouraged the growth of civic pride and patriotism, with many brandishing Ukrainian flags and embracing native folklore, crafts, music and food. The Kremlin’s subsequent annexation of Crimea united Ukrainian-Americans like never before in opposition to Russian aggression. Along Second Avenue in the East Village, local residents set up an improved shrine honoring the EuroMaidan movement with signs attacking Washington for not standing shoulder to shoulder with Kiev. Uniting the Ukrainian-American community against external threats is one thing, but looking inward and trying to define the new soul of a nation is quite another. Perhaps, as Kiev’s political class increasingly moves to coddle extremist constituencies, the foreign Ukrainian community will undertake serious reflection. Hopefully, the wider Diaspora will not only condemn right wing politics and legislation but also build upon and expand modern concepts of Ukrainian identity. Rather than appease World War II apologists, Ukraine should recognize the historic role of Jews in the country. Today, many are sorely under-informed about such contributions and may not even be aware of such literary giants as Shalom Aleichem, for example. In New York meanwhile, the expat community seems to follow familiar scripts. At the Ukrainian Museum, which supported the EuroMaidan movement by displaying patriotic posters in windows, curators have by and large played it safe by pushing rather narrow definitions of Ukrainian identity. Rather than tackle the tangled history of Ukrainian-Jewish relations, for example, the museum tends to concentrate on folk art and themes such as historic Ukrainian resistance to Russian expansionism. At the height of the EuroMaidan movement, one exhibit displayed — apparently without irony — a photo of a colorful “Cossack” protester on the Maidan [needless to say, many Jews of Ukrainian ancestry may have fearful associations of such Cossack history]. On their way out, patrons may purchase kitschy folkloric items in the museum gift shop. Just a few blocks south of the East Village lies the Lower East Side, a neighborhood which absorbed waves of Jewish immigrants in the late nineteenth and early twentieth century. Many of the immigrants hailed from Czarist Russia, prior to modern Ukrainian independence. Later, many of the Jewish arrivals moved out of the Lower East Side and assimilated into the wider culture. Arguably, however, many of the immigrants’ descendants could be considered just as Ukrainian as more recent arrivals in the East Village. To be sure, memory or associations of Ukraine may seem quite distant and abstract to the great grandchildren of Lower East Side migrants. On the other hand, it is not unheard of for Americans of Italian or Irish descent, for example, to express sympathetic ethnic ties to the mother country. Maybe it is time for Ukraine to take a hard look in the mirror and ask itself why Jewish descendants are not clamoring for the same. 8b. The largest university in Ukraine is controlled by the MAUP organization, an institutional disseminator of anti-Semitic doctrine. David Duke teaches at the institution. Former president Yuschenko is on the advisory board, as was Leonid Kravchuk, another president of Ukraine. “Organized Anti-Semitism in Contemporary Ukraine: Structure, Influence and Ideology” by Pers Anders Rudling; Canadian Slavonic Papers; Vol. 48, No. 1/2 (March-June 2006): pp. 81-118. ABSTRACT: In the wake of the Orange Revolution, Ukraine has witnessed a substantial growth in organized anti-Semitism. Central to this development is an organization, known as the Interregional Academy of Human Resources, better known by its Ukrainian acronym MAUP. It operates a well-connected political network that reaches the very top of the Ukrainian society. MAUP is the largest private university in Ukraine, with 57,000 students at 24 regional campuses. MAUP is connected to the KKK; David Duke is teaching courses in history and international relations at the university. Funded by Saudi Arabia, Libya and Iran, MAUP’s printing house publishes about 85% of the anti-Semitic literature in Ukraine. Until very recently, Ukrainian President Yushchenko and Foreign Minister Tarasiuk served on its board; former President Kravchuk still does. This paper is a study of anti-Semitism in Ukraine, of its intellectual roots, influence and strength. It traces the Soviet, Christian, German and racist political traditions and outlines the political ambitions of organized anti-Semitism in post-Orange Revolution Ukraine. 9. The most visible and best-publicized of the Nazi fighting formations in Ukraine is the Azov battalion. We now learn that Azov is training a “youth cadre”–including children as young as six. We don’t think it is much of a reach to see their “young ‘uns” as what might be accurately viewed as a Ukrainian Hitler Youth. “Shocking Pictures from Inside Neo-Nazi Military Camp Reveal Recruits as Young as Six Are Being Taught How to Fire Weapons (Even Though There’s a Ceasefire)” by Stephen Cockroft; Daily Mail; 8/12/2015. Now extremists from the Azov unit, a far-right neo-Nazi militia defending the port city of Mariupol in southeastern Ukraine, are teaching children as young as six how to fire guns in an attempt to entice them into the country’s bloody conflict. Disturbing pictures have emerged from a military summer camp held on the outskirts of Kiev which show members of the voluntary group teaching so-called ‘Azovets’ how to behave as young fighters. The children – which include girls and boys, some as young as six – are seen loading their guns, before taking part in exercises in which they crawl along the ground and fire at the enemy. The camp comes under the command of Andriy Biletsky, who once admitted that the battalion ‘do not like ceasefire at all’. The Azov men use the neo-Nazi Wolfsangel (Wolf’s Hook) symbol on their banner and several members are white supremacists or anti-Semites. The conflict broke out in April last year, when separatists rebelled in eastern Ukraine against the rule of Kiev’s new Western-looking government. Since April 2014, more than 6,500 people have been killed in the war-torn country with experts warning the crisis could carry on for years, despite a peace deal being brokered in the Belarus capital Minsk in February. 10. Some of the key considerations concerning the shootdown of Malaysian Airlines flight MH-17 are detailed in a recent post in Consortium News. The author correctly points out that it is highly unlikely that information in the hands of U.S. intelligence analysts conforms to the claims supposedly buttressed by social media. Those dubious assertions are the only “documentation” that the West has been able to generate about the downing of the plane. “Propaganda, Intelligence and MH-17” by Ray McGovern; Consortium News; 8/17/2015. During a recent interview, I was asked to express my conclusions about the July 17, 2014 shoot-down of Malaysia Airlines Flight 17 over Ukraine, prompting me to take another hard look at Official Washington’s dubious claims – pointing the finger of blame at eastern Ukrainian rebels and Moscow – based on shaky evidence regarding who was responsible for this terrible tragedy. Unlike serious professional investigative reporters, intelligence analysts often are required by policymakers to reach rapid judgments without the twin luxuries of enough time and conclusive evidence. Having spent almost 30 years in the business of intelligence analysis, I have faced that uncomfortable challenge more times than I wish to remember. So, I know what it feels like to confront issues of considerable consequence like the shoot-down of MH-17 and the killing of 298 passengers and crew amid intense pressure to choreograph the judgments to the propagandistic music favored by senior officials who want the U.S. “enemy” – in this case, nuclear-armed Russia and its Western-demonized President Vladimir Putin – to somehow be responsible. In such situations, the easiest and safest (career-wise) move is to twirl your analysis to the preferred tune or at least sit this jig out. But the trust-us-it-was-Putin marathon dance has now run for 13 months – and it’s getting tiresome to hear the P.R. people in the office of Director of National Intelligence James Clapper still claiming that the U.S. intelligence community has not revised or updated its analysis of the incident since July 22, 2014, just five days after the crash. Back then, Clapper’s office, trying to back up Secretary of State John Kerry’s anti-Russian rush to judgment, cited very sketchy evidence – in both senses of the word – drawn heavily from “social media” accounts. Obviously, the high-priced and high-caliber U.S. intelligence community has learned much more about this very sensitive case since that time, but the administration won’t tell the American people and the world. The DNI’s office still refers inquiring reporters back to the outdated report from more than a year ago. None of this behavior would make much sense if the later U.S. intelligence data supported the hasty finger-pointing toward Putin and the rebels. If more solid and persuasive intelligence corroborated those initial assumptions, you’d think U.S. government officials would be falling over themselves to leak the evidence and declare “we told you so.” And the DNI office’s claim that it doesn’t want to prejudice the MH-17 investigation doesn’t hold water either – since the initial rush to judgment did exactly that. So, despite the discomfort attached to making judgments with little reliable evidence – and at the risk of sounding like former Defense Secretary Donald Rumsfeld – it seems high time to address what we know, what we don’t know, and why it may be that we don’t know what we don’t know. Those caveats notwithstanding I would say it is a safe bet that the hard technical intelligence evidence upon which professional intelligence analysts prefer to rely does not support Secretary of State Kerry’s unseemly rush to judgment in blaming the Russian side just three days after the shoot-down. When the tragedy occurred U.S. intelligence collection assets were focused laser-like on the Ukraine-Russia border region where the passenger plane crashed. Besides collection from overhead imagery and sensors, U.S. intelligence presumably would have electronic intercepts of communications as well as information from human sources inside many of the various factions. That would mean that hundreds of intelligence analysts are likely to have precise knowledge regarding how MH-17 was shot down and by whom. Though there may be some difference of opinion among analysts about how to read the evidence – as there often is – it is out of the question that the intelligence community would withhold this data from President Barack Obama, Secretary of State Kerry and other top officials. Thus, it is a virtual certainty that the Obama administration has far more conclusive evidence than the “social media” cited by Kerry in casting suspicions on the rebels and Moscow when he made the rounds of Sunday talk shows just three days after the crash. On NBC’s “Meet the Press,” Kerry told David Gregory that “social media” is an “extraordinary tool.” The question is, a tool for what? The DNI report two days later rehashed many of the “social media” references that Kerry cited and added some circumstantial evidence about Russia providing other forms of military equipment to the rebels. But the DNI report contains no mention of Russia supplying a Buk anti-aircraft missile system that Kerry and the DNI cited as the suspected weapon that downed the plane. So, why does the administration continue refusing to go beyond such dubious sources and shaky information in attributing blame for the shoot-down? Why not fill in the many blanks with actual and hard U.S. intelligence data that would have been available and examined over the following days and weeks? Did the Russians supply a Buk or other missile battery that would be capable of hitting MH-17 flying at 33,000 feet? Yes or no. If not supplied by the Russians, did the rebels capture a Buk or similar missile battery from the Ukrainians who had them in their own inventory? Or did some element of the Ukrainian government – possibly associated with one of Ukraine’s corrupt oligarchs – fire the missile, either mistaking the Malaysian plane for a Russian one or calculating how the tragedy could be played for propaganda purposes? Or was it some other sinister motive? Without doubt, the U.S. government has evidence that could support or refute any one of those possibilities, but it won’t tell you even in some declassified summary form. Why? Is it somehow unpatriotic to speculate that John Kerry, with his checkered reputation for truth-telling regarding Syria and other foreign crises, chose right off the bat to turn the MH-17 tragedy to Washington’s propaganda advantage, an exercise in “soft power” to throw Putin on the defensive and rally Europe behind U.S. economic sanctions to punish Russia for supporting ethnic Russians in Crimea and eastern Ukraine resisting the new U.S.-arranged political order in Kiev? By taking a leaf out of the Bush-Cheney-Tony-Blair playbook, Kerry could “fix the intelligence around the policy” of Putin-bashing. Given the anti-Putin bias rampant in the mainstream Western media, that wouldn’t be a hard sell. And, it wasn’t. The “mainstream” stenographers/journalists quickly accepted that “social media” was indeed a dandy source to rely on – and have never pressed the U.S. government to release any of its intelligence data. Yet, in the immediate aftermath of the MH-17 shoot-down, there were signs that honest intelligence analysts were not comfortable letting themselves be used as they and other colleagues had been before the invasion of Iraq in 2003. To buttress Kerry’s shaky case, DNI Clapper arranged a flimsy “Government Assessment” – reprising many of Kerry’s references to “social media” – that was briefed to a few hand-picked Establishment reporters two days after Kerry starred on Sunday TV. The little-noticed distinction was that this report was not the customary “Intelligence Assessment” (the genre that has been de rigueur in such circumstances in the past). The key difference between the traditional “Intelligence Assessment” and this relatively new creation, a “Government Assessment,” is that the latter genre is put together by senior White House bureaucrats or other political appointees, not senior intelligence analysts. Another significant difference is that an “Intelligence Assessment” often includes alternative views, either in the text or in footnotes, detailing disagreements among intelligence analysts, thus revealing where the case may be weak or in dispute. The absence of an “Intelligence Assessment” suggested that honest intelligence analysts were resisting a knee-jerk indictment of Russia – just as they did after the first time Kerry pulled this “Government Assessment” arrow out of his quiver trying to stick the blame for an Aug. 21, 2013 sarin gas attack outside Damascus on the Syrian government. The sarin and MH-17 cases reveal the continuing struggles between opportunistic political operatives and professional intelligence analysts over how to deal with geopolitical information that can either inform U.S. foreign policy objectively or be exploited to advance some propaganda agenda. Clearly, this struggle did not end after CIA analysts were pressured into giving President George W. Bush the fraudulent – not “mistaken” – evidence that he used to make the case for invading Iraq in 2003. But so soon after that disgraceful episode, the White House and State Department run the risk that some honest intelligence analysts would blow the whistle, especially given the dangerously blasé attitude in Establishment Washington toward the dangers of escalating the Ukraine confrontation with nuclear-armed Russia. Given the very high stakes, perhaps an intelligence professional or two will summon the courage to step up to this challenge. For now, the rest of us are told to be satisfied with the Sunday media circus orchestrated by Kerry on July 20, 2014, with the able assistance of eager-to-please pundits. A review of the transcripts of the CBS, NBC, and ABC Sunday follies reveals a remarkable – if not unprecedented — consistency in approach by CBS’s Bob Schieffer, NBC’s David Gregory (ably egged on by Andrea Mitchell), and ABC’s George Stephanopoulos, all of whom hewed faithfully to a script apparently given them with two main talking points: (1) blame Putin; and (2) frame the shoot-down as a “wake-up call” (Kerry used the words repeatedly) for European governments to impose tight economic sanctions on Russia. If the U.S. government’s hope was that the combination of Kerry’s hasty judgment and the DNI’s supportive “Government Assessment” would pin the P.R. blame for MH-17 on Putin and Russia, the gambit clearly worked. The U.S. had imposed serious economic sanctions on Russia the day before the shoot-down – but the Europeans were hesitant. Yet, in the MH-17 aftermath, both U.S. and European media were filled with outrage against Putin for supposedly murdering 298 innocents. German Chancellor Angela Merkel and other European leaders, who had been resisting imposing strong economic sanctions because of Germany’s and the European Union’s lucrative trade with Russia, let themselves be bulldozed, just two weeks after the shoot-down, into going along with mutually harmful sanctions that have hurt Russia but also have shaken the EU’s fragile economic recovery. Thus started a new, noxious phase in the burgeoning confrontation between Russia and the West, a crisis that was originally precipitated by a Western-orchestrated coup d’état in Kiev on Feb. 22, 2014, ousting Ukraine’s elected President Viktor Yanukovych and touching off the current civil war that has witnessed some of the worst bloodshed inside Europe in decades.. It may seem odd that those European leaders allowed themselves to be snookered so swiftly. Did their own intelligence services not caution them against acquiescing over “intelligence” from social media? But the tidal wave of anti-Putin fury in the MH-17 aftermath was hard if not impossible for any Western politician to resist. Odd that neither Gregory nor other “mainstream” stenographers have thought to ask Kerry, then or since, to share what he says he “knows” with the American people and the world – if only out of, well, a decent respect for the opinions of mankind. If Kerry has sources beyond “social media” for what he claims to “know” and they support his instant claims of Russian culpability, then the importance of his accusations dictates that he describe exactly what he pretends to know and how. But Kerry has been silent on this topic. If, on the other hand, the real intelligence does not support the brief that Kerry argued right after the shoot-down, well, the truth will ultimately be hard to suppress. Angela Merkel and other leaders with damaged trade ties with Russia may ultimately demand an explanation. Can it be that it will take current European leaders a couple of years to realize they’ve been had — again? The U.S. government also is likely to face growing public skepticism for using social media to pin the blame on Moscow for the downing of MH-17 – not only to justify imposing economic sanctions, but also to stoke increased hostility toward Russia. The Obama administration and the mainstream media may try to pretend that no doubt exists – that the “group think” on Russia’s guilt is ironclad. And it seems likely that the official investigations now being conducted by the U.S.-propped-up government in Ukraine and other close U.S. allies will struggle to build a circumstantial case keeping the Putin-did-it narrative alive. But chickens have a way of coming home to roost. The kids are arguing about who gets which wooden gun. “That’s my gun,” says one young boy loudly. He likes it because it fits nicely into his small hands. Once the argument is settled, the kids run off to play at being soldiers. It’s a scene that one could see on playgrounds and at summer camps for kids all over the world. But this particular camp is run by the Azov Battalion founded by lawmaker Andriy Biletsky, its former commander. Located in the wooded area of Kyiv’s Pushcha Vodytsya district, kids at this summer camp aren’t just playing soldiers – they’re getting actual military training from soldiers who have fought on the front line in Russia’s war against Ukraine. Named Azovets, the camp has been the subject of negative coverage in the Russian media, pro-Russia websites and even U.K. tabloid The Daily Mail. “Neo-Nazi summer camp: Ukrainian kids taught to shoot AKs by Azov battalion members (PHOTOS),” reads Kremlin-controlled RT’s headline for its story about the camp. “Shocking pictures from inside neo-Nazi military camp reveal recruits as young as SIX are being taught how to fire weapons (even though there’s a ceasefire),” reads the headline in the Daily Mail’s sensationalized and inaccurate article. The Azovets summer camp accepts children of Azov Battalion members, as well as kids from Kyiv’s nearby Obolon district and further afield. It opened on June 22, runs weeklong programs of activities for groups of 30 to 40 kids. Officially, it is for children aged from nine to 18, but there are kids as young as seven there. A few of the kids had already attended it for several weeks in a row. What makes the camp most controversial is that it’s run by Azov fighters, some of whom have been labeled as far-right supporters and neo-Nazis. Critics say the battalion’s symbol is an inverted Wolfsangel that has oblique but uncomfortable associations with Nazism. Biletsky founded a neo-Nazi group in Ukraine called the Social-National Assembly, and there certainly are neo-Nazis among the battalion’s ranks, some sporting Nazi tattoos. Some media have reported that up to 20 percent of Azov’s fighters are neo-Nazis, though the battalion’s press officers are always at pains to emphasize that Azov, as a military formation, does not share the ideology of its founder Biletsky, or indeed have any ideology other than fervent patriotism. One of its most famous foreign members, a Swedish sniper called Mikael Skillt, has admitted his past far-right leanings, although he says he has since rejected neo-Nazi ideology. But others in the battalion haven’t. When the Kyiv Post visited the Azovets camp on Aug. 19 the kids were busy with a range of activities, including stripping down and assembling AK-47 assault rifles, target practice (with air guns), tackling assault courses, and practicing combat poses and patrolling. They also take part in various sports and games, do rappelling and climbing, and practice other more traditional scouting and woodcraft skills like tying knots. “I’ve been here only for three days, but I’ve realized that it’s not a camp where you just play games. We’re getting military training here,” one of the kids at the camp told the Kyiv Post. Out in the forest next to the camp, a group of kids was getting some weapons safety advice from an Azov trainer. “Do you know what would happen if you kept your fingers on the trigger? If it were a real gun, you could kill your comrades. So, don’t do it!” the trainer barks. “Yes sir!” the kids answer. The children then practice medically evacuating wounded soldiers from the battlefield. The militaristic atmosphere at the camp, including strict discipline, has plainly influenced some of the children. Two older kids, who, like many of the children at the camp, have taken noms de guerre (Medic and Physicist) in imitation of Ukraine’s real soldiers, said they now wanted to join the Azov Battalion. “I want to defend my homeland. There are comrades who support my idea. I think that if it’s necessary, I will fight,” 17-year old Physicist told the Kyiv Post. The children at the camp are organized into four groups, depending on their age, with each group overseen by a trainer and caregiver. The camp’s day starts early, at 7 a.m. sharp, and ends at 11 p.m. The children sleep in tents. Access to Azov’s own website and supporting websites was closed off to the public last September when the battalion was integrated into the National Guard of Ukraine, but the camp has a page on the Russian social network Vkontakte (https://vk.com/tabir.azovec) where it is promoted, and where people can apply to become volunteers, or contact the camp to send their children there. “The Mission of the Camp: To form the Ukrainian of a new era – a patriot, who is ready to actively participate in building and defending Ukraine,” the page’s description reads. The military-patriotic songs that the children sing every day as a part of the camp’s program do seem to be one of the more popular activities for the kids. Late at night, sitting around a blazing campfire, they belt out their favorites – patriotic songs dating back to Ukraine’s previous struggles for independence in the early- to mid-20th century. Azov spokesman Stepan Badai said that the children are not taught songs that call for the killing of Russians or anybody else. “The children sometimes change lyrics when they sing, but they are taught traditional folk or patriotic songs,” Badai said by phone. The evening singalongs are one of Sofia’s favorite activities too. “Many of the songs are about the invincibility of the Ukrainian people. I like those that have words about people who fight to the death – these are the real patriots of their homeland,” she said. That kind of puts DismaLand in perspective. Lionized as a nationalist hero in Ukraine, Stepan Bandera was a Nazi sympathizer who left behind a horrific legacy. When Western journalists traveled to Kiev in late 2013 to cover the Euromaidan protests, they encountered a historical figure few recognized. It was Stepan Bandera, whose youthful black-and-white image was seemingly everywhere — on barricades, over the entrance to Kiev’s city hall, and on the placards held by demonstrators calling for the overthrow of then-president Viktor Yanukovych. Bandera was evidently a nationalist of some sort and highly controversial, but why? The Russians said he was a fascist and an antisemite, but Western media were quick to disregard that as Moscow propaganda. So they hedged. Whoever Bandera was, all were in agreement that he couldn’t have been as nasty as Putin said he was. But thanks to Grzegorz Rossolinski-Liebe’s Stepan Bandera: The Life and Afterlife of a Ukrainian Nationalist, it now seems clear: those terrible Russians were right. Enlisting in the Organization of Ukrainian Nationalists (OUN) at age twenty, he used his growing influence to steer an already-violent group in an even more extreme direction. In 1933, he organized an attack on the Soviet consul in Lviv, which only managed to kill an office secretary. A year later, he directed the assassination of the Polish minister of the interior. He ordered the execution of a pair of alleged informers and was responsible for other deaths as well as the OUN took to robbing banks, post offices, police stations, and private households in search of funds. What sent Bandera off in such a violent direction? Rossolinski-Liebe’s massive new study takes us through the times and the politics that captured Bandera’s imagination. Galicia had been part of Austro-Hungary prior to the war. But whereas the Polish-controlled western half was incorporated into the newly established Republic of Poland in 1918, the Ukrainian-dominated eastern portion, where Bandera was born in 1909, was not absorbed until 1921, following the Polish–Soviet War and a brief period of independence. It was a poor fit from the start. Bitter at being deprived of a state of their own, Ukrainian nationalists refused to recognize the takeover and, in 1922, responded with a campaign of arson attacks on some 2,200 Polish-owned farms. The government in Warsaw replied with repression and cultural warfare. It brought in Polish farmers, many of them war veterans, to settle the district and radically change the demographics of the countryside. It closed down Ukrainian schools and even tried to ban the term “Ukrainian,” insisting that students employ the somewhat more vague “Ruthenian” instead. When the OUN launched another arson and sabotage campaign in summer 1930, Warsaw resorted to mass arrest. By late 1938, as many as 30,000 Ukrainians were languishing in Polish jails. Soon, Polish politicians were talking about the “extermination” of the Ukrainians while a German journalist who traveled through eastern Galicia in early 1939 reported that local Ukrainians were calling for “Uncle Führer” to step in and impose a solution of his own on the Poles. The conflict in the Polish-Ukrainian borderlands exemplified the ugly ethnic wars that were erupting throughout eastern Europe as a new world war approached. Conceivably, Bandera might have responded to the growing disorder by moving to the political left. Previously, liberal Bolshevik cultural policies in the Ukrainian Soviet Socialist Republic, had caused a surge in pro-Communist sentiment in the neighboring Polish province of Volhynia. But a number of factors got in the way: his father’s position in the church, the fact that Galicia, unlike formerly Russian Volhynia, was an ex-Habsburg possession and hence oriented toward Austria and Germany, and, of course, Stalin’s disastrous collectivization policies, which, by the early ’30s, had completely destroyed the Soviet Ukraine as any sort of model worth emulating. Consequently, Bandera responded by moving ever farther to the right. In high school, he read Mykola Mikhnovs’kyi, a militant nationalist who had died in 1924 and preached a united Ukraine stretching “from the Carpathian Mountains to the Caucasus,” one that would be free of “Russians, Poles, Magyars, Romanians, and Jews.” Entry into the OUN a few years later exposed him to the teachings of Dmytro Dontsov, the group’s “spiritual father,” another ultra-rightist who translated Hitler’s Mein Kampf and Mussolini’s La Dottrina Del Fascismo and taught that ethics should be subordinate to the national struggle. Entry into the OUN also plunged him into a milieu marked by growing antisemitism. Anti-Jewish hatred had been deeply bound up with the concept of Ukrainian nationhood since at least the seventeenth century when thousands of Ukrainian peasants, maddened by the exactions of the Polish landlords and their Jewish estate managers, engaged in a vicious bloodletting under the leadership of a minor nobleman named Bohdan Khmelnytsky. Ukraine was the scene of even more gruesome pogroms during the Russian Civil War. But antisemitic passions rose a further notch in 1926 when a Jewish anarchist named Sholom Schwartzbard assassinated the exiled Ukrainian leader Symon Petliura in Paris. “I have killed a great assassin,” declared Schwartzbard, who had lost fourteen family members in the pogroms that swept through the Ukraine when Petliura headed up a short-lived anti-Bolshevik republic in 1919–1920, on surrendering to the police. But after hearing testimony from survivors about impaled babies, children cast into flames, and other anti-Jewish atrocities, a French jury acquitted him in just thirty-five minutes. Jews are guilty, terribly guilty, because they helped consolidate Russian rule in Ukraine, but “the Jew is not guilty of everything.” Russian imperialism is guilty of everything. Only when Russia falls in Ukraine will we be able to settle the Jewish question in our country in a way that suits the interest of the Ukrainian people. By this point, Bandera was already in jail serving a life sentence following a pair of highly publicized murder trials in which he taunted the court by giving the fascist salute and crying out, Slava Ukraïni – “Glory to Ukraine.” But he was able to escape following the German takeover of western Poland beginning on September 1, 1939 and make his way to Lviv, the capital of eastern Galicia. But the Soviet incursion on September 17 sent him fleeing in the opposite direction. Eventually, he and the rest of the OUN leadership settled in German-controlled Cracow, about two hundred miles to the west, where they set about preparing the organization for further battles still to come. The Nazi invasion of the Soviet Union, which the OUN leadership seems to have gotten wind of months ahead of time, was the moment they had been waiting for. Not only did it promise to free the Ukraine from Soviet control, but it also held out the prospect of unifying all Ukrainians in a single state. The dream of a greater Ukraine would thus be realized. A month earlier, Bandera and his chief lieutenants — Stepan Lenkavs’kyi, Stepan Shukhevych, and Iaroslav Stets’ko — had put the finishing touches on an internal party document entitled “The Struggle and Activities of the OUN in Wartime,” a to-do list for when the Wehrmacht crossed the Soviet border. We treat the coming German army as the army of allies. We try before their coming to put life in order, on our own as it should be. We inform them that the Ukrainian authority is already established, it is under the control of the OUN under the leadership of Stepan Bandera; all matters are regulated by the OUN and the local authorities are ready to establish friendly relations with the army, in order to fight together against Moscow. The document continued that “it is permissible to liquidate undesirable Poles . . . NKVD people, informers, provocateurs . . . all important Ukrainians who, in the critical time, would try to make ‘their politics’ and thereby threaten the decisive mind-set of the Ukrainian nation,” adding that only one party would be permitted under the new order — the OUN. Although Bandera and his followers would later try to paint the alliance with the Third Reich as no more than “tactical,” an attempt to pit one totalitarian state against another, it was in fact deep-rooted and ideological. Bandera envisioned the Ukraine as a classic one-party state with himself in the role of führer, or providnyk, and expected that a new Ukraine would take its place under the Nazi umbrella, much as Jozef Tiso’s new fascist regime had in Slovakia or Ante Pavelic’s in Croatia. Instead of a partner, he saw them as an obstacle. Obsessed with the British naval blockade of World War I, which had caused as many as 750,000 deaths from starvation and disease, he was determined to block any similar effort by the Allies by expropriating eastern grain supplies on an unprecedented scale. Hence the importance of the Ukraine, the great granary on the Black Sea. “I need the Ukraine in order that no one is able to starve us again like in the last war,” he declared in August 1939. Grain seizures on such a scale would mean condemning vast numbers to starvation, twenty-five million or more in all. Yet not only did the Nazis not care, but annihilation on such a scale accorded perfectly with their plans for a racial makeover of what they viewed as the eastern frontier. The result was the famous Generalplan Ost, the great Nazi blueprint that called for killing or expelling up to 80 percent of the Slavic population and its replacement by Volksdeutsche, settlers from old Germany, and Waffen-SS veterans. Plainly, there was no room in such a scheme for a self-governing Ukraine. When Stets’ko announced the formation of a Ukrainian state “under the leadership of Stepan Bandera” in Lviv just eight days after the Nazi invasion, a couple of German officers warned him that the question of Ukrainian independence was up to Hitler alone. Nazi officials gave Bandera the same message a few days later at a meeting in Cracow. Subsequently, they escorted both Bandera and Stets’ko to Berlin and placed them under house arrest. When Hitler decided on July 19, 1941 to partition the Ukraine by incorporating eastern Galicia into the “General Government,” as Nazi-ruled Poland was known, OUN members were stunned. Instead of unifying the Ukraine, the Nazis were dismembering it. When graffiti appeared declaring, “Away with foreign authority! Long live Stepan Bandera,” the Nazis responded by shooting a number of OUN members and, by December 1941, placing some 1,500 under arrest. Still, as Rossolinski-Liebe shows, Bandera and his followers continued to long for an Axis victory. As strained as relations with the Nazis might be, there could be no talk of neutrality in the epic struggle between Moscow and Berlin. Ukrainian nationalism, he went on, had taken shape “in a spirit similar to the National Socialist ideas” and was needed to “spiritually cure the Ukrainian youth” who had been poisoned by their upbringing under the Soviets. Although the Germans were in no mood to listen, their attitude changed once their fortunes began to shift. Desperate for manpower following their defeat at Stalingrad, they agreed to the formation of a Ukrainian division in the Waffen-SS, known the Galizien, which would eventually grow to 14,000 members. Rather than disbanding the OUN, the Nazis had meanwhile revamped it as a German-run police force. The OUN had played a leading role in the anti-Jewish pogroms that broke out in Lviv and dozens of other Ukrainian cities on the heels of the German invasion, and now they served the Nazis by patrolling the ghettoes and assisting in deportations, raids, and shootings. Citing the Polish historian Grezegorz Motyka, Rossolinski-Liebe says that the UPA killed close to 100,000 Poles between 1943 and 1945 and that Orthodox priests blessed the axes, pitchforks, scythes, sickles, knives, and sticks that the peasants it mobilized used to finish them off. Rossolinski-Liebe carries the story of Bandera and his movement through the Nazi defeat when the Galizien division fought alongside the retreating Wehrmacht and then into the postwar period when those left behind in the Ukraine mounted a desperate rearguard resistance against the encroaching Soviets. Mutilated corpses appeared with signs proclaiming, “For collaboration with the NKVD.” According to a 1973 KGB report, more than 30,000 people fell victim to the OUN before the Soviets managed to wipe out resistance in 1950, including some 15,000 peasants and collective-farm workers and more than 8,000 soldiers, militia members, and security personnel. Even given the barbarity of the times, the group’s actions stood out. Stepan Bandera is an important book that combines biography and sociology as it lays out the story of an important radical nationalist and the organization he led. But what makes it so relevant, of course, is the OUN’s powerful resurgence since the 1991. Although Western intelligence eagerly embraced Bandera and his supporters as the Cold War began to stir — “Ukrainian emigration in the territory of Germany, Austria, France, Italy, in the greatest majority is a healthy, uncompromising element in the fight against the Bolsheviks,” a US Army intelligence agent noted in 1947 — the movement’s long-term prospects did not seem to be very promising, especially after a Soviet agent managed to slip through Bandera’s security ring in Munich in 1959 and kill him with a blast from a cyanide spray gun. With that, the Banderites seemed to be going the way of all other “captive nations,” far-right exiles who gathered from time to time to sing the old songs but who otherwise seemed to be relics from a bygone era. The enemy came and took their Ukraine. But they were not afraid; likewise we must not be afraid. They hung their machine guns on their necks and went into the woods. They fought against the Russians, Germans, Jews, and other scum who wanted to take away our Ukrainian state! And therefore our task — for every one of you, the young, the old, the gray-headed and the youthful — is to defend our native land! Except for the omission of the Poles, the speech was an indication of how little things had changed. The movement was as xenophobic, antisemitic, and obsessed with violence as ever, except that now, for the first time in half a century, thousands of people were listening to what it had to say. One might think that the liberal West would want nothing to do with such elements, but the response was no less unscrupulous than it was during the opening years of the Cold War. Because the banderivtsi were anti-Russian, they had to be democratic. Because they were democratic, their ultra-right trappings had to be inconsequential. The Bandera portraits that were increasingly prominent as the Euromaidan protests turned more and more violent, the wolfsangel that was formerly a symbol of the SS but was now taken up by the Azov Battalion and other militias, the old OUN war cry of “Glory to Ukraine, glory to the heroes” that was now ubiquitous among anti-Yanukovych protesters — all had to be ignored, discounted, or whitewashed. Ukraine won a seat on the U.N. Security Council on Thursday and immediately promised to use the platform to wage a political battle against Russia for annexing Crimea and supporting eastern Ukrainian separatists. The 193-member General Assembly also elected four other countries — Egypt, Japan, Senegal and Uruguay — to the U.N.’s most powerful body. All five countries were unopposed in their bids for the non-permanent seats and will start their two-year terms on Jan. 1. Fireworks are expected when Ukraine takes its seat alongside permanent member Russia. Klimkin was in New York earlier this week meeting with U.N. ambassadors and letting the world know that relations with Russia will be anything but conciliatory. It’s about promoting the U.N. Charter and its commitments to peace, sovereignty and human rights, he said, and Ukraine is ready to work with other council members “to bring stability and security” in Africa, the Middle East and elsewhere. But Ukraine remains committed in its fight “against Russian aggression and showing that Russia is behind what is going on in entire of Donbas,” the eastern region controlled by pro-Russian separatists, Klimkin stressed. He said Ukraine will make the case that Russian troops, mercenaries and weapons must leave the country’s east, that Ukraine must regain full control of its border with Russia, and that the international community, the U.N., and human rights monitors must have full access to the region. Ukraine will also be working to keep up “political pressure on Russia to recognize that the Crimea is illegally occupied,” to strengthen U.S. and European sanctions, and to get human rights monitors into Crimea, Klimkin said. “We need strong support of the whole international community to sort out the Crimean issue because the Crimea is Ukrainian and will be Ukrainian,” he said. Russia had quietly campaigned against Ukraine’s bid, according to diplomats who spoke on condition of anonymity because discussions have been private. In Thursday’s Council election, Senegal was the top vote-getter with 187 votes, followed by Uruguay with 185, Japan with 184 and Egypt with 179. The new council could also see clashes between Japan and rival China, also a permanent member, as well as with Russia. Japan has territorial disputes with both countries. Violence from Svoboda party activists a concern for some in small northern city. Two months after local elections were held across Ukraine, residents of the small northern city of Konotop are expressing shock and dismay over the behavior of newly chosen Mayor Artem Semenikhin of the neo-Nazi Svoboda party. According to reports, Semenikhin drives around in a car bearing the number 14/88, a numerological reference to the phrases “we must secure the existence of our people and a future for white children” and “Heil Hitler”; replaced the picture of President Petro Poroshenko in his office with a portrait of Ukrainian national leader and Nazi collaborator Stepan Bandera; and refused to fly the city’s official flag at the opening meeting of the city council because he objected to the star of David emblazoned on it. The flag also features a Muslim crescent and a cross. Svoboda, known as the Social-National Party of Ukraine until 2004, has been accused of being a neo-Nazi party by Ukrainian Jews and while party leaders have a history of making anti-Semitic remarks, their rhetoric has toned down considerably over the past years as they attempted to go mainstream. While it managed to enter mainstream politics and gain 36 out of 450 seats in the Rada, Ukraine’s parliament, the party’s support seemed to evaporate following the 2014 Ukrainian revolution, in which it played a central role. It currently holds six seats in the legislature. The party managed to improve its standing during recent municipal elections, however, obtaining some 10 percent of the vote in Kiev and garnering second place in the western city of Lviv. For the most part, however, Svoboda is far from the major worry for Ukrainian Jews that it was only two years ago. “It is a sad, but a reality when anti-Semites are being elected in local governing bodies, even mayors promoting hate and intolerance. Konotop is a clear case,” said Eduard Dolinsky of the Ukrainian Jewish Committee. For the Jews of Konotop, however, worries persist, with Ilya Bezruchko, the Ukrainian representative of the US-based National Coalition Supporting Eurasian Jewry, saying he believed residents, who generally get along well with local Jews, voted for Semenikhin because he projected an image of someone who could bring change and reform a corrupt system. However, Semenikhin himself has a history of fraud, having been arrested for posing as an electricity company worker in order to extract payments from businesses in Kiev in 2012, Bezruchko charged. Bezruchko, whose late grandfather was the head of the community and whose mother currently works for the city council, said Semenikhin and his assistant have left angry comments on his Facebook page in response to critical articles that the Jewish activist had posted on his blog. He claimed that someone close to the mayor claimed that he would be hospitalized if he returned to the city from Kiev, where he currently lives, and that the mayor himself posted to say that his mother was corrupt and should be fired from her job. “The reaction of [the] community is shock. People are shocked it could happen in [a] city and nobody believed it could happen here but it happened somehow,” community activist Igor Nechayev told The Jerusalem Post by phone Monday. While there have been a couple of instances of anti-Semitic graffiti over the past decade and one occasionally hears references to conspiracy theories identifying Ukrainian political leaders as Jews, for the most part, relations between the Jewish community and their non-Jewish neighbors are cordial, he said. However, while the mayor attempts to make sure his statements never cross over into outright anti-Semitism, many things he says can be interpreted in such a way, he continued. As an example, he referred to a recent statement by Semenikhin in which the mayor refused to apologize for anti-Jewish actions taken by far-right nationalists in World War II, intimating that it was because those responsible for the Holodomor famine of the 1930s were largely Jewish. The Holodomor was a manmade famine that came about during the collectivization of agriculture in the Soviet Union and which led to the starving deaths of millions. Ukrainians consider it a genocide. “The community is discussing the situation and they understand that the mayor is balancing between anti-Semitism— – he isn’t crossing a redline with statements but saying border things that can be understood as anti-Semitic,” he explained. Speaking to the Post, Vyacheslav Likhachev, an anti-Semitism researcher affiliated with the Vaad of Ukraine and the Euro-Asian Jewish Congress, said “Ukrainians are afraid of the Russian threat, not the threat of national radicalism,” and that “Semenikhin has successfully created himself an image of a defender of Ukrainian independence, and voters were able to support him, not paying attention to the radicalism of his views. Unfortunately, Likhachev said the current Ukrainian legislation does not allow to forbid those with right-wing views to take part in the election, or to remove them from the elected positions.